The ‘Plakaatboeken’ or Placards of Batavia Castle were published by the Batavian Society for Arts and Sciences under the supervision of the Director of the former Landsarchief (state archive) of the Netherlands Indies in Batavia, Mr. J.A. van der Chijs. 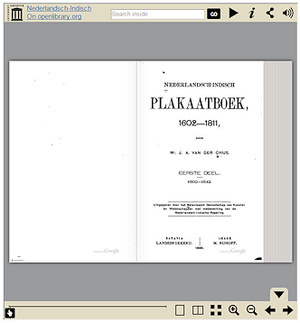 It is a publication of (parts of) the original archive series of ‘Plakaaten’, in the archive of the Supreme Government, inv. nrs. 2248-2419 (161 volumes) The publication of a selection of the placards from these 161 archive volumes in 17 volumes took thirteen years of selection, transcription, summarization and listing. It is not clear yet whether all placards in the original archival series were published by Van der Chijs. Several placards were clearly directly transcribed from the Resolutions of Batavia Castle and the Resolutions of the College of Alderman. All volumes have been scanned in the past by other institutions, and uploaded for further digitization and publication.